Logo on promotional items, dealing with Bike to Work Week including but not limited to, banners on downtown light posts, posters, & advertisements. 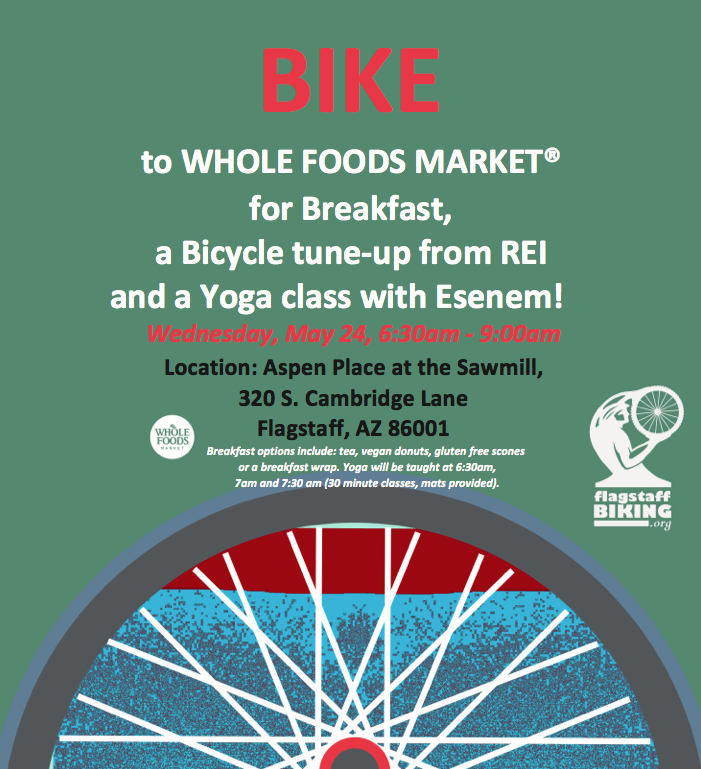 Full page full-color ad in the Bike to Work Week edition of Out-Spoke’n – inserted in the FlagLive paper, the week before the event. Logo on promotional items, dealing with Bike to Work Week including but not limited to, posters, & advertisements. 1/2 page full-color ad in the Bike to Work Week edition of Out-Spoke’n – inserted in the FlagLive paper, the week before the event. 1/4 page full-color ad in the Bike to Work Week edition of Out-Spoke’n – inserted in the FlagLive paper, the week before the event. 1/8 page full-color ad in the Bike to Work Week edition of Out-Spoke’n – inserted in the FlagLive paper, the week before the event. Donation is time, food and supplies, not cash. Location and need for breakfast stops subject to our discretion. Supply coffee, juice and food for the amount of anticipated visitors to your breakfast station. Make sure your coffee supplier can set you up by your opening time. We will supply a sign, FBO materials and maps. Feel free to hand out information for your business, we want to support you as much as you support us! Supply volunteers to staff your station from 6:15am-9:00am. Serving time is advertised at 6:30-9:00am. One certified food handler must be present at all times. See http://www.az-hospitality.org/food/ for more information. The course is online and costs $18/person. Ask around chances are one of your co-workers is already certified! Bring a table for your food and a chair to sit down once and a while. Your feet will get tired while standing that long! We are asking for each station to keep a number of the amount of cyclists that come to the station. This helps us plan for coming years. Ideas for food: Bagels, donuts, muffins, burritos, yogurt, granola, fruit, energy bars, juice, coffee, hot chocolate, etc. The ideas are endless! Bring a couple of garbage bags or boxes with you to dispose of trash and to collect recyclable materials. Have fun! Bring a light jacket, a hat, sunscreen, comfortable clothing and get ready to make some new friends! Go Crazy! Decorate your breakfast station in your own “flare”! Bring a cowbell or noise maker to draw attention to your station. We know Flagstaff loves costumes! Let’s see who can have the most festive station in town! FBO will be making rounds to take photographs for our website and social media. We welcome collaborating with your fellow businesses to make your breakfast stop a MUST stop location. For more info, please email Jolene at elserj6@npgcable.com . To sign up, please fill our form. Payments must be received by April 15th for Title & Co-Sponsors. All other payments April 30th.